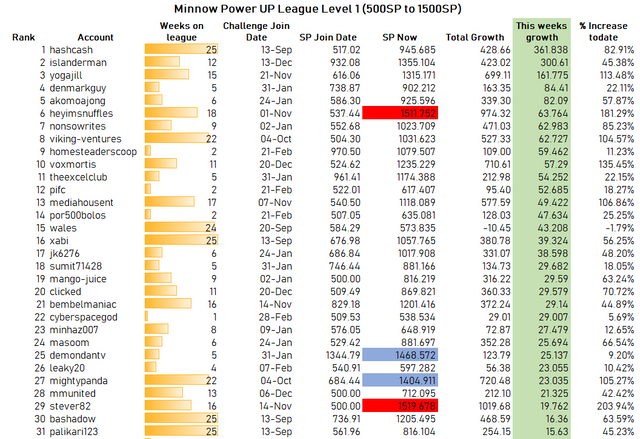 Welcome to the Minnow Power Up League. A big shout out a welcome to all the new league entrants this week @cyberspacegod, @xcountytravelers, @luegenbaron and @handofzara. Some of which are newly graduated from the Redfish league. @steemcommunity is a witness project by @paulag and @abh12345. There are many good witnesses out there and doing your research is important. I hope you will take the time to read our witness introduction post and consider us as one of your Steem witness. If you are not sure how or why to vote for a Steem witness drop a question below and we will do our best to help you. You can join or leave at any stage, all you must do is leave a comment below and let us know that you want in or out. Don’t forget we are all trying to grow so please do consider supporting the person above you and the person below you in the league by visiting their blog posts or even voting on their comments in this post. Every Thursday we will be using SteemSQL database managed by @arcange to gather details on the Owned SP for each person that has entered the league. 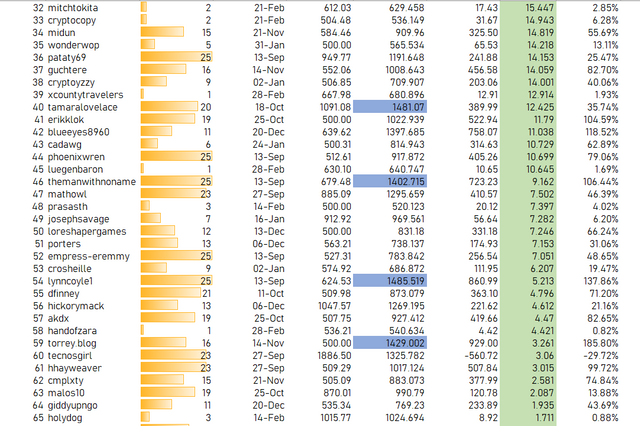 The current weekly owned SP will be compared to the SP held last week. 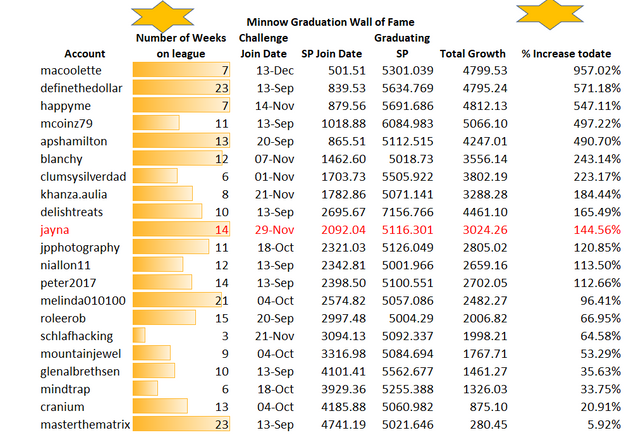 The person with the highest SP growth for the current week will be on top of the leader board. There are 4 levels depending on your SP levels. Once you graduate from one, you will be automatically placed on the next. When you graduate from the 4th you will be placed on the Minnow Wall of Fame. As this post could get rather long with the 4 levels, as we grow, we may consider splitting this into different posts on different days. Congratulations to @hashcash being first in the league this week with a massive power up of 2361.838 SP. In second is @islanderman and third is @yogajill. Well done the both of you! Graduating this week from level 1 to level 2 are @heyimsnuffles and @stever82. Congratulations & nice work to both of you. On the home stretch in level 1 are @demondantv @torrey.blog, @tamaralovelace @mightypanda, @themanwithnoname and @lynncoyle1 you are so close to graduating from level 1, Steem on! There are now 23 participants on level 2, and this weeks winner is @kaerpediems with an amazing SP growth of 166.383 this week. Congratulations also to @libert who finished in second place again this week. On the home stretch this week from level to is @ericwilson keep going level 3 is in sight. @anthonyadavisii you are first in this weeks level 3 league with an SP growth of 331.334, nice!. Also, good stuff from @for91days you are in second place, and nice work @urbangladiator you made third. @veryspider and @gillianpearce you both graduate from level 3 to level 4. Sweet! On the home stretch from level 3 to level 4 is @riverflows and @urbangladiator. Level 4 is in reach, go get it. 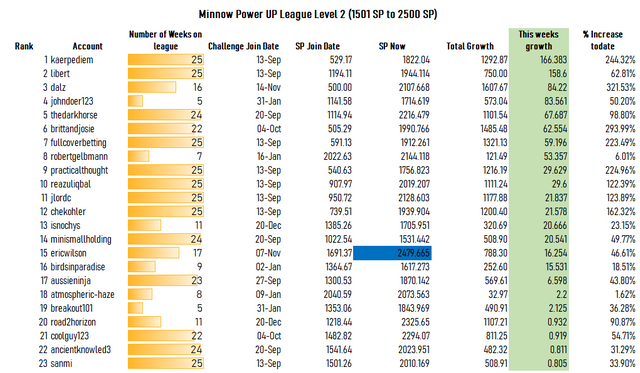 @wolfhart you are first in level 4 league this week with amazing growth of 730.164SP. @shepz1 in second place. @sagescrub you are on the home stretch of level 4, dolphinhood awaits you. Welcome to the Wall of Fame. This wall is a showcase of the minnows that took part in this league and graduated to dolphin-hood. We had 1 new graduate this week. Congratulations to @jayna, finally you are a dolphin, nice work. You have been placed on our wall of fame. Well done to @islanderman, @yogajill, @denmarkguy, @akomoajong, @heyimsnuffles, @libert, @dalz, @johndoer123, @for91days, @urbangladiator, @shepz1, and @scrawly who have all received some STEEM this week. 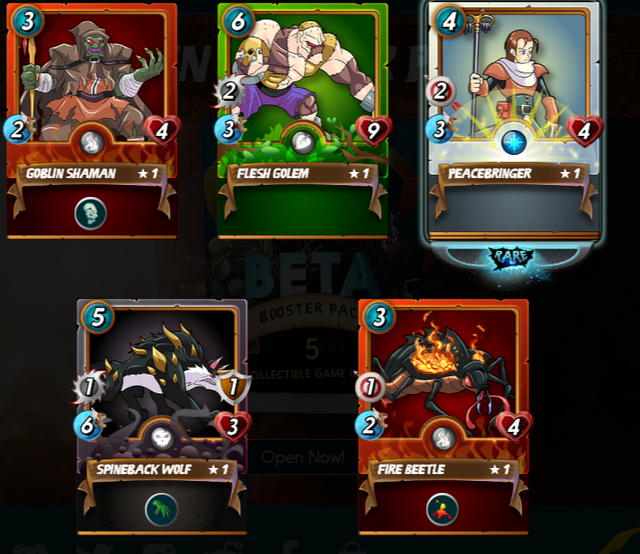 And congratulations to @hashcash, @kaerpediem, @anthonyadavisii, and @wolfhart for placing 1st in their respective level and picking up a pack of @steemmonsters cards. Some of the cards are worth 100's of dollars - be lucky! That's it for this week, cheers all! Well, congratulations everyone for their placings and more importantly, for the growth experienced. Well done. Hopefully the latest initiative will bring more minnows to the post and in turn help them reach that lovely 5k milestone. Cheers! Can’t wait to see this pond grow even more with the movement towards 10k! We are hoping to see more new faces appear on this post in the coming weeks. Thanks for your support! Superb and thank you kindly for the steem. Wahey! That's twofold exciting! Thanks team!! I'm pushing hard to see if I can top 3500 next week. Thanks for the motivation!! Nice one and well done on the Power-up prize this week! Well done to all of us! @checohler will be next week the week I start to have look back? @jlordc you are still too far away but. Am chasing you! Come on all up to dolphinhood! Still keeping to my original plan! Mid 2020 that is! Thanks for the reward! You rock :) Will support you with all of your projects. Our pleasure, courtesy of yabapmatt. Thanks for the support! Awesome! Almost there. Thank you so much for this project. Awesome ... Thank you for this surprise!!! Our pleasure, great job on the power up this week! Thank you so much for you continued support and efforts! Our pleasure and a big thank you for your support also! Good to see everyone doing well and powering up. Thanks @steemcommunity for everything you do. You guys are an important tool for all us small accounts. Good to see @wolfhart and @shepz1 getting closer to the finish line. thanks and you had a good increase in SP yourself. That would be decent. That is my average every week. Just call me steady Eddie I suppose. Have a system now that I operate and it works. I notice you regularly score will in the Curation league - CR do start to grow quite nicely as time goes on. Lol. This is top secret. Not really and is pretty basic. All I do is put whatever daily rewards that come in onto ocdb and it builds up rather quickly and normally takes me a bout 2 weeks to get going properly. I just roll everything and that is why I know where I am score wise over a two week period. One week for current rewards coming in and knowing what is going on ocdb which pays out the following week. It is a two week cycle and that simple. Seems he's been loading up while the sale is on! the 1st of the month. every 1st I buy Steem. the low price now makes it seem like a lot of fiat was invested. the smart man would just Power Up 200-300 SP at a time (weekly) but that would be gaming the system. That's pretty honest of you and a solid and fair approach to take. Having planned purchase days takes the emotion out of trading, or looking for the best entries which do often cloud judgement. Layering buys also reduce risk, although as it turns out, loading up in the .2's would have been ideal! I'm gutted that i've had no choice but to do the opposite for the past 6 months, but I'm glad that you and others have seen this as a great buying opportunity. 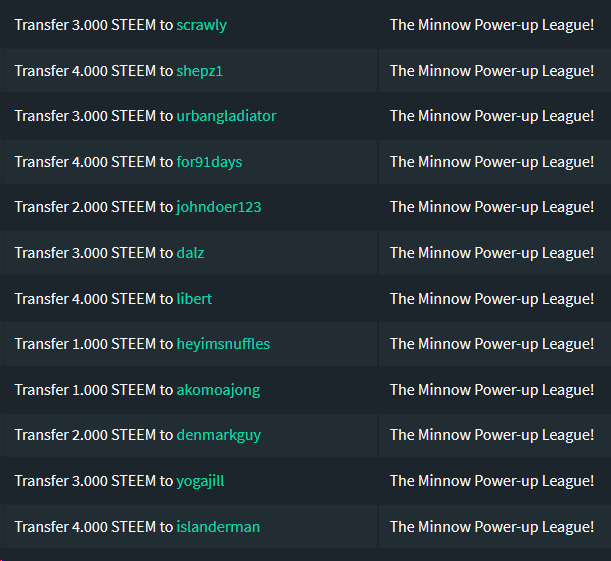 I would have loved to buy the hell out of Steem at .2’s . But you can only do what you can with the fait you have. We all have to work within the restrictions that are upon us and figure the best way to invest. It has been a challenge over the years. That sounds just awesome and I really want to join! That is just awesome...looking forward to! 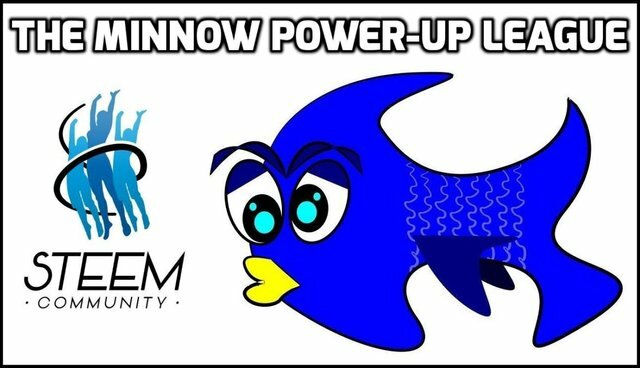 are you on the redfish power up league on my account? No I'm not, I'm still new and haven't come across that, just came across this post is there a link you can provide to that post? I know of an account who owns 25% of all the Flesh Golams and so that would be one I'd hold onto for sure. Like everything else a little knowledge about the subject helps. The gold card from a couple weeks ago was the same as hitting the lottery. Yeah those rather addictive cards will stunt your power-up stats, but they are hopefully a solid alternative and will rise in value on their own as time goes on. Thank you much for the welcome. We look forward to seeing where this adventure goes! We have slowed down quite a bit since i have been pushing @heyhaveyamet. It was important though. We have slowed down quite a bit since i have been pushing @heyhaveyamet. It was important though. New people are the future of Steem. @simplymike is one of the people who follows and used our posts. She is awesome! Hmmmm, I will touch base with her. I totally understand! The weather has beaten me up horribly and took it's toll yesterday. However, I have the windows opened and live streaming in!